Veggie Meadow Ⓥ: What is Gelatine? 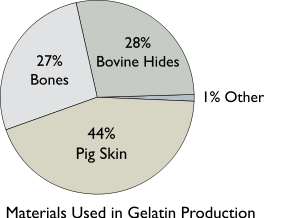 Gelatine is a mixture of peptides and proteins extracted from boiling the skin, boiled crushed bones, connective tissues, organs and some intestines of animals such as domesticated cattle, chicken, and pigs. An vegetarian alternative substance is called Agar-Agar, which is derived from seaweed. Another is made from the root of the Kuzu. Cheese – its got WHAT in it!!! Vegetarians do NOT eat fish or chicken!